Spencer ran on his own or with a friend who had a similar interest in running to lose weight. Hoping to find some extra motivation, Spencer read the book Born to Run and instantly found himself inspired by the idea of running 50 miles. From that point, Spencer set his long-term goal to complete a 50-mile run. Progress on that goal came slowly. He did not run his first race, a half-marathon, until three years into running. But when he finished that race in 1:31, Spencer realized, “I’m a real runner now!” His success in the half-marathon gave him the motivation he needed to ramp up his training. Three weeks later, he ran the North Face Endurance Challenge Marathon. Shortly after, Spencer joined the Montgomery Country Road runners and dove into the local racing scene. Though he would put in strong efforts during his races, Spencer used races more as high-intensity training runs for longer efforts. One of those efforts included the Four State Challenge — a 43-mile route tracing the Appalachian Trail between the Pennsylvania and Virginia state lines. Spencer claimed the fastest known time in July 2017, though it was soon eclipsed by 40 minutes by Barkley Marathons winner John Kelly. While preparing for the Four State Challenge, Spencer’s favorite part was drawing maps and doing all that research, which inspired him to look at other routes to run. Spencer looked at a map and realized that Gettysburg was not too much farther away. On top of that, the Gettysburg to D.C. route was mostly downhill once the route hit the C&O Canal. It was not until after the Four State Challenge that Spencer realized he could connect those two places. Spencer started plotting the route back in October. His initial idea was much shorter than what he ended up doing. “The most direct route is actually down Georgia Avenue. You can basically go down Georgia Avenue the whole way,” he explains. That route would have been around 76 miles. That was his first idea, but Spencer quickly dismissed that plan because he did not want to get caught running most of his route along the side of narrow country roads. That was when Spencer started thinking of running along the Appalachian Trail and C&O Canal towpath instead. These trails were much more accessible and easier for putting up water stops or campsites. Somewhere along the way, it occurred to Spencer that the route he was forming looked strikingly like the route taken by Civil War Confederate General Robert E. Lee and his soldiers as they retreated to Arlington after the Battle of Gettysburg. Though he originally did not plan to go through Antietam, Spencer decided to extend his route to pass through it in order to honor the history of that historic route. That extension added about 20 miles overall to the trip. In the end, Spencer’s route was 125 miles long. The longest he had ever run prior to that was 65 miles. “It was a little aggressive,” he admits. Now that his route was planned, Spencer ran certain parts of it throughout the year just to make sure he understood it all. “From moment of conception, preparing for the run took about a year of work,” he said. In addition to planning out his route, Spencer needed to find crew and pacers to help him along his run. “He was super motivated, which impressed me because he wasn’t doing an organized event where he would get a result on paper that could be communicated,” Kelman said. Another person Spencer asked for help was Daniel Frank of Columbia, who rode his bike alongside Spencer during the nighttime portion of the run. The two first met when Frank was gunning forSpencer’s Four State Challenge record, but an injury cut that short. With a route planned out and a crew in place, the day finally came. Spencer started his run at 6:30 am on July 1, a time he chose for significant historical reasons. But Spencer did not finish. 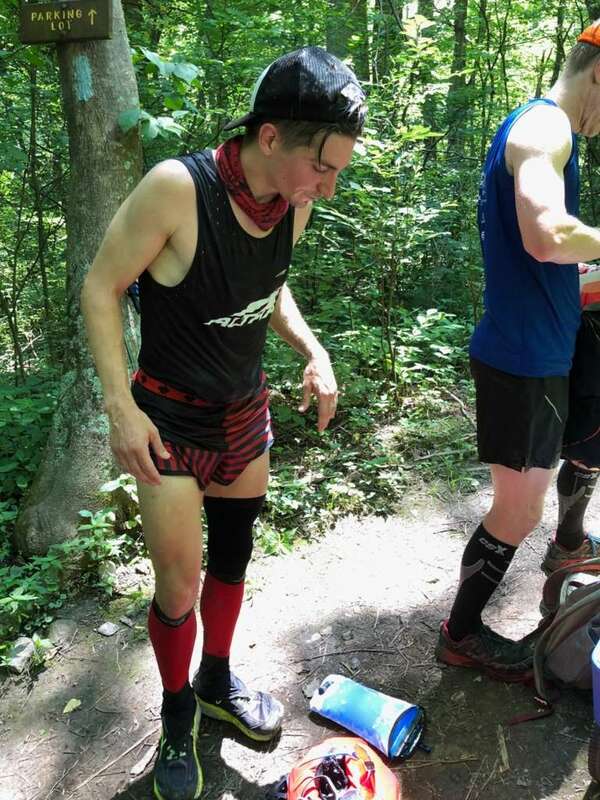 Though he hit his first 100 miles in his goal time, he did not consider how badly the heat would affect him overall, especially on the final few miles. But despite some challenges during the first day, Spencer said he ended the day strong. “[At the end of the day,] I finished 100 miles. I was feeling really good. 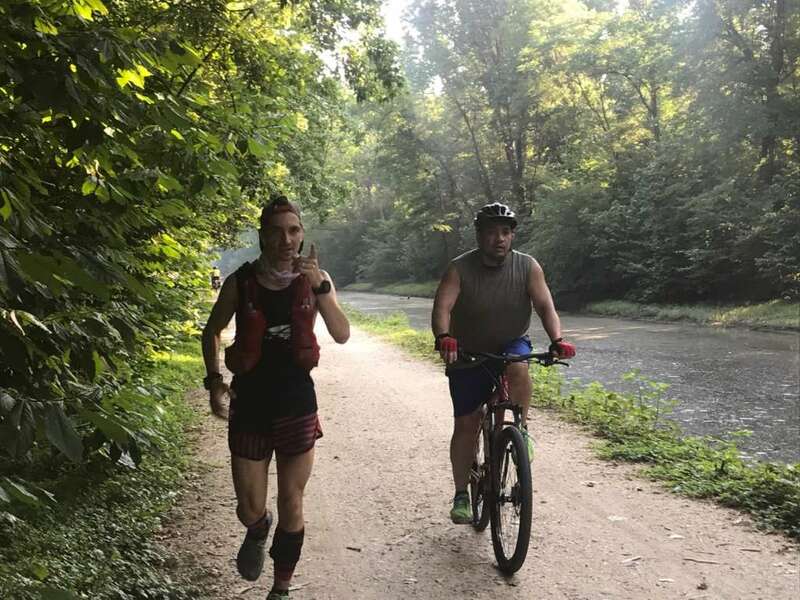 My 100th mile was a 8:45 [pace] on the C&O Canal. I felt really good. I was cruising. As it would happen, I finished my 100th mile in 22 hours and 30 minutes, which I felt really great about.” In the end, Spencer beat his 100-mile projection by about an hour and a half. “Adrian hit the 100-mile mark for the first time in his career around sunrise and I purposely gave him that time to himself to bask in the moment. You could tell that it was a special moment for him,” Frank recalled. After the 100-mile mark, however, things began to change. The sun came out just as Spencer reached Great Falls Park. “I left Adrian after his 106th mile so I could make a PT appointment. He was still moving well but was having trouble taking in calories and it was starting to get hot again. I really wish we had ice for him at that moment,” Frank said. Realizing that running in the heat for the remainder of the journey was both a health risk and would not be enjoyable, Spencer decided to end his run after 111 miles. He had been at it for almost 26 hours, running for 20 hours, 30 minutes and 14 seconds of it. “I was having a blast and I wanted to end on that note, not on a 6-hour death march,” he said. In the end, Spencer said he wholly enjoyed the entire experience. “Adrian took this challenge on despite absurd heat and took it all in stride and with a smile on this face. He literally never said one negative thing during the 10 hours I was with him. I know he is very grateful for the people who helped him, but honestly I am grateful for the opportunity to be a part of such an awesome adventure,” Frank said. Spencer said he hopes he inspires other people to try similar things in the future. Spencer is not done with that route. 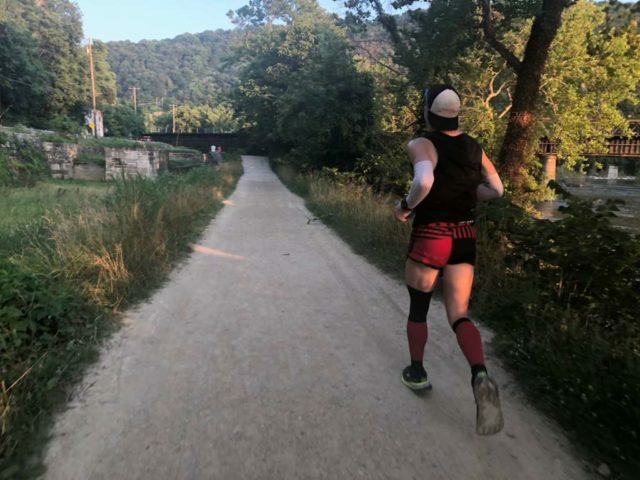 He plans to go back this summer and run the last 14 miles with some friends and even plans to go back and attempt the entire run again, potentially self-supported next time. Though Kelman said if Spencer asked for his help again, he would gladly support him.